If you like your music a bit weird or maybe if you’re looking for that ideal album to pop onto your gramophone before you start passing round the extra strong skunk you have which will no doubt result in a really bad trip, then look no further. This lovely album is a blend of krautrock and experimental oddness. 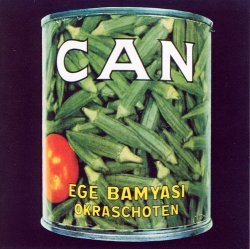 All Can albums are odd and Ege Bamyasi is no exception as I found out after my discovery of Can’s Tago Mago. Idly discussing the band with a work mate one day resulted in the same chap bringing a shed load of Can albums for me to listen to. Eye opening stuff if a lot weird ,it’s no surprise the band isn’t very main stream but like with all bands that appear on the music project, I’ve tried the best out and kept them. So if you’re in a situation as described in the opening paragraph to this entry, or perhaps you just want to expand your mind with sound, I suggest you try Ege Bamyasi as a taster to lure you into the deep dark realms of Mr Suzuki’s mind.